I confess: I like Tom Stoppard because his plays highlight all the intellectually stimulating but somewhat pretentious (aren’t they all?) discussions I’ve had over the last 15 years. His latest, The Hard Problem, was no different. It follows Hilary, a psychology student who we meet as she applies for a job at the Krohl Institute for Brain Science, hoping to inject some humanity into their research. As always, Stoppard treats us to some witty banter, this time about altruism, animal behaviour, coincidence, consciousness, ego, evolutionary biology, morality, neuroscience, religion, and the worlds of academia and finance. The Hard Problem is perhaps less clever and fresh than Arcadia or RosenGuild, but fun and thought-provoking nonetheless. Some of the characters are true to the bone while others, disappointingly, feel typecast, but there is definitely some familiar truth in all. Overall, I’m pretty happy with the brain-lit Hytner production that we saw streamed live from the National Theatre in London – worth seeing. 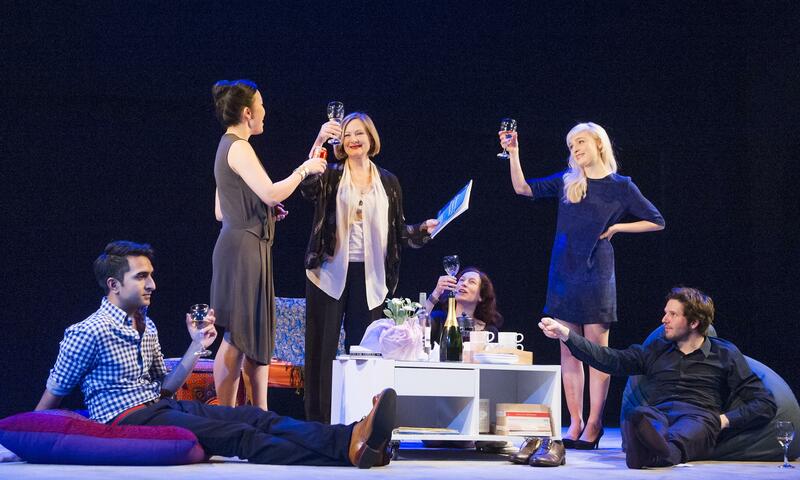 Parth Thakerar (Amal), Vera Chok (Bo), Lucy Robinson (Ursula), Rosie Hilal (Julia), Olivia Vinall (Hilary) and Damien Molony (Spike) in The Hard Problem by Tom Stoppard @ Dorfman, National Theatre. This entry was posted in Art, Human Condition, Science and tagged Behaviour, Contemporary, Ethics, Philosophy on April 16, 2015 by Madhura Killedar.